Since joining the company in July of the year 2014, he has worked steadily with the firm’s client base, drafting response on office actions, monitoring annuities and another deadlines; he has worked on several projects with experts and provides advice to clients regularly within his capacity on intellectual property processes. 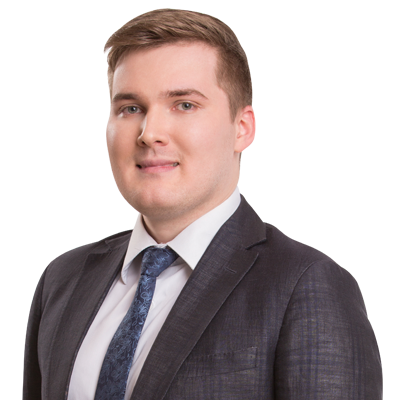 Vitaliy also works with patent databases and expertly carries out subject-specific patent searches with the analysis of available information and conclusion. Vitaliy received a Bachelor’s Degree with honours in 2012 at the National Technical University of Ukraine “Kyiv Polytechnic Institute”, specializing in Engineering for Machine-Tool Building. He went on to receive a Master’s Degree also with honours in 2014 at the same University, but on the specialization “Professional of intellectual property”. As a Patent Agent Vitaliy is faced daily with providing a full range of services to a long list of clients, and can advise on any aspect of application prosecution. He specializes in drafting responses to office actions, and he is responsible for coordinating work with examiners of various patent offices. As for hobbies and leisure, Vitaliy prefers to spend his free time socializing with friends, playing board games, cycling, and playing football. He also loves to read; specifically books within the science-fiction genre. Vitaliy is a co-author of the Guidebook to Patenting in the CIS and EAPO.